Nearly 400 years after Henry Hudson sailed to the bay in 1609, the University of Delaware released a State of the Delaware Basin Report that defines the health of the 13,000 square-mile watershed in Delaware, New Jersey, New York, and Pennsylvania. 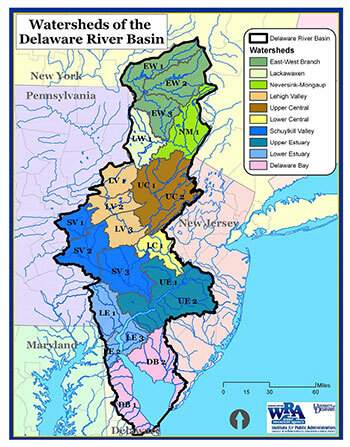 The report was assembled for the Delaware River Basin Commission (DRBC) and Partnership for the Delaware Estuary (PDE) by a consortium of the four land – grant universities from the states in the basin – Cornell University, Pennsylvania State University, Rutgers University, and University of Delaware. This collaboration represents the first time since JFK signed the DRBC compact in 1961 that the four land grant universities from the basin states have worked together in the Delaware River Basin. The DRBC and PDE issued State of the Basin and Estuary reports in 2008 and again in 2013. More forests in the basin then there were in the 1930s. The Delaware River Basin Commission plans to update the State of the Basin Report at five-year intervals. In the next half-decade, emphasis will be placed on programs to reverse the decline of those indicators in poor health. Recent history indicates that environmental health can be improved using the cooperative watershed approach espoused by the Federal government and the four states through the comity of the Delaware River Basin Commission and the Partnership for the Delaware Estuary. Funding for the undergraduate researchers was provided by the UD Water Resources Center headed by Tom Sims.